It gives me great pleasure to cede the floor to guest-poster Jenna Helwig today. 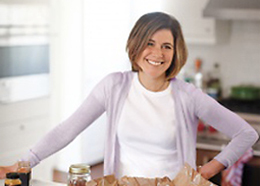 Jenna is the senior food editor at Parents Magazine and author of Baby-Led Feeding, an inspiring manual for raising good eaters and kickstarting the family meal habit nice and early. Yes, your baby can eat the salmon you’re looking at above. Read on for the recipe and for a fun little surprise. Take it away, Jenna. You may wonder why this dinner party-worthy (but Tuesday night-easy) salmon dish is in a book called Baby-Led Feeding. This is baby food? Yes! And grown-up food and teenager food, kid food, and toddler food. Baby-led feeding is my take on baby-led weaning, the increasingly popular method of introducing babies to solid foods. Instead of being spoon-fed purees, babies eat finger foods right from the start, grasping soft foods in their sweet, chubby little fingers. Baby-led feeding encourages babies to really get to know their food, to smell it, touch it, play with it, taste it, and yes, probably drop a lot of it on the floor (at least at first). It helps develop hand-eye coordination and teaches babies to recognize and rely on their own hunger cues. But, my favorite part about baby-led feeding is that babies can take part in family meals from an earlier age, eating the same foods that their parents, caregivers, and siblings do—like the family meals in Baby-Led Feeding such as Sweet Potato and Quinoa Burgers, Spiced Lamb Meatballs, Slow-Cooker Maple-Dijon Pork, or this Mother-in-Law Salmon. My mother-in-law, Iolanda was born and raised in southern Italy. When she was 16, a man in her village 10 years her senior (my father-in-law!) chose her to be his wife. They had barely met when they were married. Soon after, they immigrated to Montreal, Canada. Within five years Iolanda had three sons. Iolanda didn’t have an easy life those first couple of decades, learning how to be the wife that her traditional husband expected, navigating a foreign culture, learning a new language, suffering through ridiculously frigid winters, and wrangling three rambunctious boys. This salmon is a mainstay in Iolanda’s repertoire. Slathered in a Dijon mustard, lemon, olive oil, parsley, and garlic mixture with a dollop of mayo for creaminess, the fish simply bakes in the oven. It really is dead easy. My mother-in-law prepares a side of salmon and then cuts it into pieces, but it’s faster (and more budget-friendly when you’re cooking for a smaller crowd) to start with individual filets. GIVEAWAY ALERT! 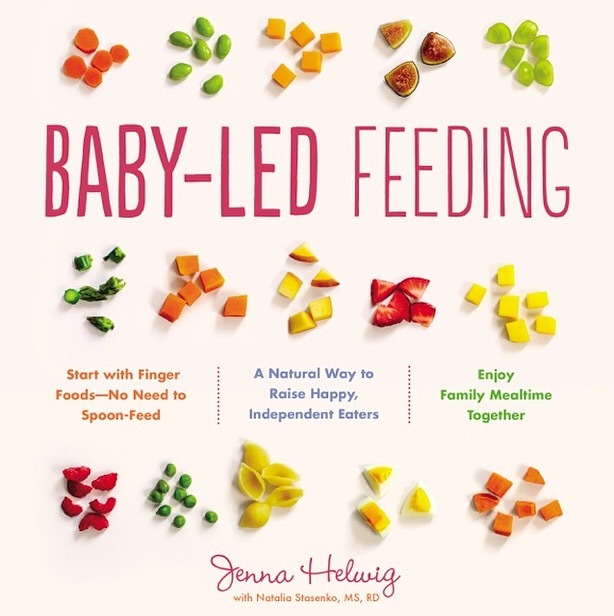 I’m giving away a copy of Baby-Led Feeding to two lucky readers — just leave a comment to be eligible. Contest ends Thursday, March 15 at noon ET. Good luck! UPDATE: The winners have been notified. Thank you for playing! For more Jenna, follow her on Instagram or, for baby and toddler ideas, here. Place the salmon fillets on the parchment. Sprinkle with the salt (except for baby’s portion) and pepper to taste. In a small bowl, stir together the olive oil, mayonnaise, lemon juice, and mustard. Stir in the parsley and garlic. Spoon the olive oil mixture over the salmon fillets. Roast the fish until it flakes easily in the center when tested with a fork or knife, 12 to 15 minutes, depending on the thickness. If you’re serving a baby, cool and flake the fish with a fork. Mother-in-Law Salmon from Baby-Led Feeding by Jenna Helwig. © Copyright 2018 by Jenna Helwig. Used by permission of Houghton Mifflin Harcourt. All rights reserved. Photo by Lauren Volo. I’m planning to make this during a women’s retreat, hoping it will be nourishing and special. Oh, what a delightful book! I have a 9-month-old who LOVES to eat–I’m struggling to keep his meals fresh. I’d love a copy! I’ll be starting BLW with my second in under a month – always interested in new recipes! Just in time for me to wrap my head around solids for my baby! This recipe seems simple but would make a weekday a little more special. Yum! this looks great! my 10-month old loves salmon and we’re always looking for family friendly recipes and would love this cookbook! Thanks for the recipe and post. I’m very interested in learning more about baby led feeding with my first child coming soon! This is so timely for us! Our 8 month old is loosing interest in purees and wants what we eat. I’d love love love to get a copy of this book! I have an 11 month old and am still trying to get her to enjoy finger foods (she still prefers to be spoonfed). I would love to have this book for some recipes and tips! I’m right at this stage with my five month old and am so intrigued! Thank you for this discussion. My sister is doing baby led weaning and would love this book! This is perfect timing, since I’m 2 months from my due date and already looking forward to feeding baby real food! I’m due with baby #1 in August, and I have read a lot about this method! I’m very interested in learning more about it (and making the salmon above, yum). Would love to win a copy of this book, and even if I don’t, I just may have to buy it. MY third baby is now 5 months old and almost ready for solids. I’d love to learn more about this approach! We started my 17 month old on solids this way. I would love some new recipe ideas for the whole family. Just heard about baby led weaning no; and we are going to use this for our daughter. This looks like an amazing book! Thank you for sharing. We are in the midst of BLW with our 9 month old. Would love to have more food options so we can keep things interesting for her! Third and final installment to this family coming in August. I hate my nightly fights with my current youngest and could use fresh insight on how to make this whole eating thing easier the third time around when we get there! Hopefully at least one of my kids can start their life liking food! Thank you for the recipe – I would love a copy of the book! My 6 month old isn’t interested in purees anymore, and I’m struggling to think of creative meals to make that we can all enjoy. i’d love to learn more about baby led feeding – our first is due in 7 weeks! i’m currently pregnant and would love this book! Interested in learning more about baby-led feeding as I plan for #2! I would love this book! I’m having my first baby in July! I would love a copy of this book! I’m currently introducing my baby to solids! My family is doing baby led weening and I think the baby will like this salmon. I would love this book for my family! We just started our son on solids using the baby led feeding method. It’s been so much fun watching him explore his food. His hand eye coordination has improved immensely, and he is loving spending time with the family at the dinner table. So far he has had roasted chicken, salmon, meatloaf, broccoli, asparagus, carrots, banana and avocado. He loves all the food, but his favorite by far has been salmon and avocado. We’re expecting our first – a baby girl! – in August, and would love to use this approach. I’ve heard great things but, truthfully, know little about the details. This looks delicious! I tried baby-led weaning with my 20 month old and it didn’t work as promised for us – she was very prone to choking and picky about food from the very start, regardless of whether we let her eat on her own (she ate nothing) or purees (she ate nothing.) Now she eats a fair amount of food but is still picky. The BLW mindset is still helpful because I just trust that she gets what she needs and we don’t have to fight about it. I only give her whole foods and offer new things every week and try not to be obviously frustrated that she eats no vegetables. Just want to share in case others attempt BLW and still end up with picky eaters. Baby led feeding would be perfect for this phase of our lives! We have a 3 year old and a 1 year old. We try to make sure everyone eats the same basic foods for each meal so there’s no short order cooking. I’m always open to new ideas, recipes, and strategies! This salmon looks delicious! Bookmarked! I have a just one-year old and a three-year old. I can definitely use the help. My older daughter is incredibly picky and I don’t want her to influence her sister too much. What a lovely story – and a great book to have. Always looking for more recipes to feed my growing family. This topic is coming at the perfect time for me and my 4 month-old! I truly look forward to the mess, knowing we’re on the path to family meals. I am totally overwhelmed trying to figure out how best to introduce food to our 8 month old outside of purees. Would love some direction! This looks delicious — with two picky eaters this sounds like just what I need! Omg this is perfect timing! I’m just now starting to read about blw as my son is 5 mo old and we are about to start solids. This method makes so much more sense to me than going thru pureed stages. 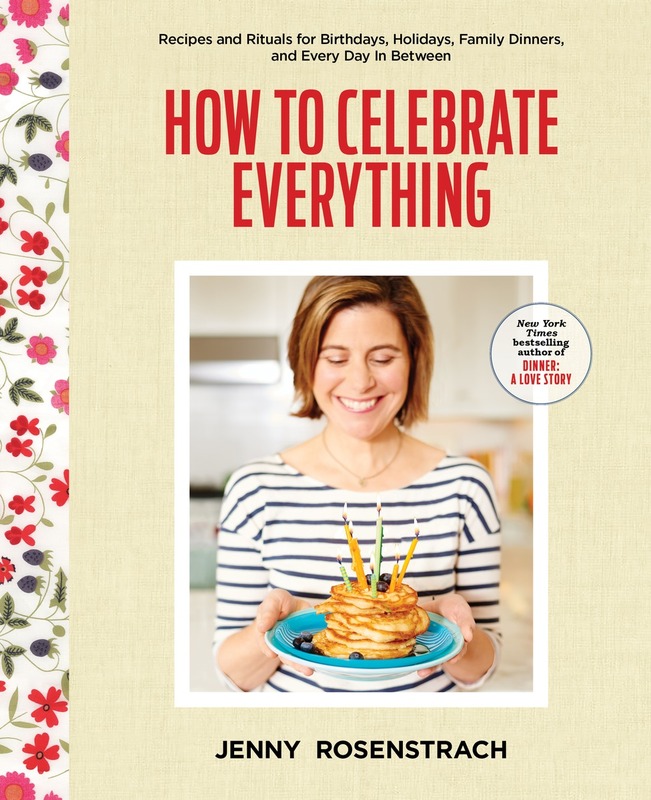 I would absolutely love to win this cookbook! Have started to do this with my 10-month-old and it’s going so well. Would love to check out her book! Sounds like a cookbook worth having! What a good giveaway! My 1o-month-old only wants to eat with his fingers! I’d love to read more about baby-led weaning, and this recipe looks delicious. This sounds great! 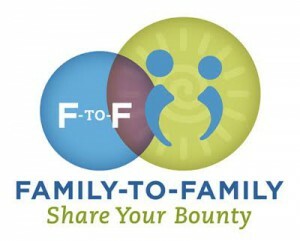 I’m getting ready to introduce solids to my youngest and I like Jenna’s ideas for making her part of family meals. Can’t wait to try this salmon! Thanks! Baby-led feeding is the way to go. Right now my baby is not liking food very much. This sounds delicious and I love the idea of baby led weaning! I would love to try that approach with our 2nd baby (due this May! ), thank you for the inspiration AND the delicious recipe. I did mostly baby-led weaning with my first baby, and I can’t wait to start again with the next. I could use some new recipes! My 9-month-old has not been interested in purees, but BLW has intimidated me. Would be interested in checking out this book to learn how we might prepare our family meals (we also have a 4-year-old) in a baby-friendly way. Would love this book to learn more about baby led weaning for my 3 month old. Love this! Coincidentally, my daughter is having her first meal tonight! I love the idea of a cookbook, BLW is daunting!! I’ve got an almost 6 month old and have been researching baby led weaning and this book would be perfect! I love this concept for baby food! We are raising our first little one, and she is almost 3 months old. I’d love a copy of your book to know more about how to teach her healthy habits and be a part of family dinners! Just getting ready to start my six month old on food – this book would be perfect! Perfect timing! We’re starting to research baby led weaning as our 4 month old daughter prepares to start solids in a few months. Can’t wait to get my hands on a copy of this! I’ve got 6 month old twins and I’m very interested in this book. I am about to start feeding my baby real food and this idea of baby led feeding is fascinating. Plus it sounds like it saves money (no baby food)! I would love a copy of this book! We did baby led weaning partly with my daughter but I would love to read more to feel more prepared for the next baby. Even partly, however, I feel like she’s a really decent eater still now at 2. This looks delicious! I’d love to learn more about baby led feeding for our first baby on the way! With 4 school-aged kiddos and a baby on the way, I’d love a book with insights on meals we all can eat together and enjoy! Learning to cook for my family really took off as a newly minted stay at home mom trying to keep herself sane at home with a new baby. One of my first great successes was white fish with fresh orange juice and herbs. It was a marvel to me that all three of us on the family could enjoy the same simple delicious meal and became my standard for family dinners thereafter. A decade and three more babies later, feeding tender, flakey fish to my newest eaters still takes me back to that revelatory dinner. I started my son on purées and eventually moved to finger foods, still earlier than most people I knew but not right from the start. Now my daughter is 5 months and I’d love the guidance on doing it from the start! 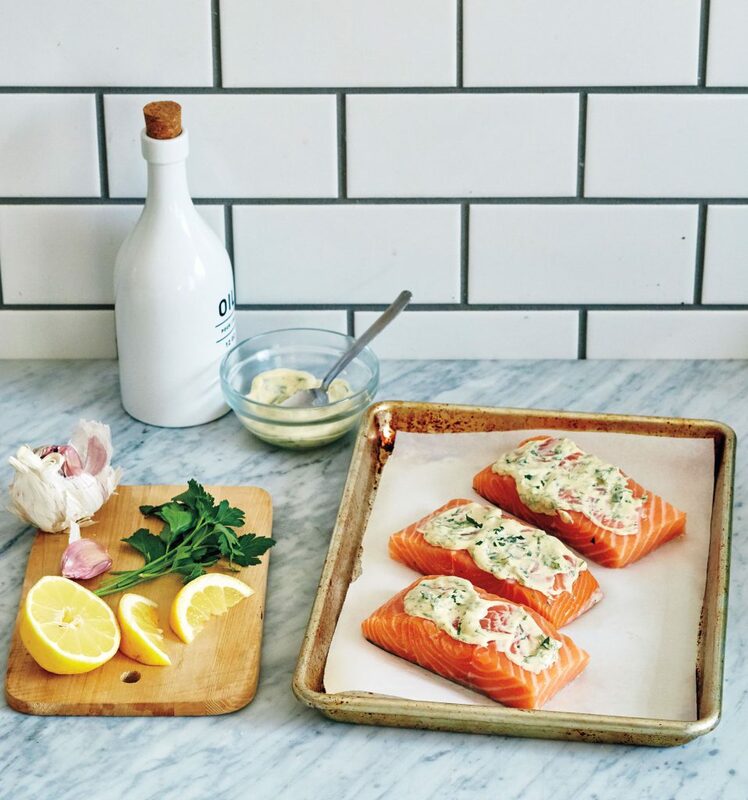 Also, we will be making this salmon for dinner tomorrow, it looks delicious and we always have those ingredients! This looks awesome! Trying this tomorrow! Baby is due ANY day now, and I look forward to introducing foods to him/her via baby led feeding! I’m having a baby this month! This sounds like a really sensible approach to family eating. I’d love to have the book! Ha! I have a 7 month old that I feed with a combination of purees and finger foods. I’ve been renewing Jenna’s other book from the library on repeat, would love to have this one! Looking forward to trying this easy recipe. I’m always looking for foods to entice my two-year-old daughter to eat more adult foods. I’m also trying to make sure that she doesn’t know that chicken nuggets exist. Thanks for this! So simple yet sounds delicious! I have an eight month old baby and we are doing baby-led weaning right now! Thanks so much for featuring this book. I’m going to check it out! This looks great addition to our meal rotation! As a new mother to a ten month old I am trying to find recipes that are easy, delicious and healthy for all three of us. Oh, thank you for this! I have an 8 month old and I have been slow to dip my toes into introducing things other then purees, but it is time. I really appreciate the post and the introduction to Jenna’s work. Dinner a Love Story will make me brave! This looks delicious! I like the idea of baby-led feeding but feel intimidated, too (I have a 10-month old). Jenna’s book looks like a great resource. I’ve got a little buddy I’m feeding and am always looking for new ideas, I’d love this book! I have struggled to find easy and tasty meal ideas that both my son and I can enjoy together instead of making two separate meals every time! Really looking forward to trying this recipe out for my 9 month old and sharing more meals together. Thanks! We are expecting our second baby soon, and I would love to have the book! My first is a good eater so far, but we will see how that goes as she progresses in toddlerhood! I’m pregnant with my first child, so this giveaway is great timing! We’re just about to start solids with our 5 month old girl and this would be perfect! Just got the very good news that my sister is having a baby, and this would be a lovely present for her! I just had my fifth baby (after a long break) in November and would love to win a copy of this book. So much has changed with regard to infant feeding since I had my first daughter 16 years ago. Back then it was all purées in ice cube trays and grinding grains in a coffee grinder to make baby porridges. I would love to learn more about this idea! Finally, baby recipes that I don’t have to convert from the metric system! Everything is always British! My daughter is 5.5 months old and I’m so excited to start baby led weaning with her in a few weeks! I’d love a copy of this book! We’re expecting our first baby in May, looking forward watching and helping her explore food. This book would be a great help! My 17th great-nephew is due any day. I’d love to win a copy to gift his parents. I believe in this method after watching my own five grandchildren (now all ravenous eaters aged 2-7) be introduced to food in this vein. Makes so much sense and it’s so fun to see babies eating salmon and blueberries and pickles and gnawing on chops. Love it, thanks for the idea! My daughter is 20 months old and could really start eating with us, but all of my recipes are so grown up… Would love to get some new ideas! We have a four month old and are about to start solids. I love the idea that she will eat at the table with us and hope to foster a love of all food in her. Will definitely pick up this book! I have an 11 month old (in Italy!) who loves to eat. Would enjoy reading a copy of the book. My 3 year-old finally ate salmon the other day, only on about my 25th attempt serving it to him. I bet if I’d made it this way it would’ve been a hit much sooner. Thanks for sharing! Never thought to pair salmon with mayo! With a fairly particular 2 year old and a new baby arriving in June, I’m up for new ideas! And I can’t wait to try this salmon! Perfect gift for new parents. Can’t wait to try this easy salmon recipe for my husband and I. Keep up the good work, Jenna. I’m expecting my first baby in June so this would be very timely! Also it seems like Iolanda’s story would make a good book. I wish I had had this when my kids were young……one “equal opportunity” eater and one equally picky eater! My mouth is watering after reading this post! I would be a fool not to add salmon to next week’s menu. But most of all, I adore the description of Iolanda! Oh to bloom into such an amazing woman! Thanks Stephanie! That’s very sweet. She is a special lady. Trying to get my 10 month old more interested in salmon – and, actually, hoping my 4 year old will eventually come around on it too! Definitely going to try this. This is fantastic! I am always struggling to figure out what to feed my 10 month old! He loves food, but I feel like I am always struggling to find new things for him. This book would be AWESOME! This salmon looks delicious! I have 4 month old twin boys, so I’d love a copy of this book. I have a six month old baby that I’ve just started to feed! I would love a copy of this. Expecting my third soon and have two kind of picky eaters at home already that may benefit from some fresh recipes! I just sent this recipe to my mother in law! Though I don’t have a baby of my own, I’m a doctor and eating coach (for Big People;) and LOVE reading of Jenna’s work supporting healthy eating from the start of things. And because I eat simple, plant-and-fish-forward, paleo-primal, looking forward to making this lovely dish! Thank you! We just stared BLW, and, so far so good! I have the original cookbook, but I would love to add another to my repertoire. Family dinners and explorative eating are important to my husband and me, and I love that BLW encourages same from a young age. I did baby led weaning with both my children who are now 1 & 3. They are great eaters and have never had the expectations of eating something different from us at meal times. Our daughter has been lovingly nicknamed the food-disposal. A little courage and good food can go a long way. I don’t have babies to feed anymore, but man, the Picky Eater Taxonomy sure brought back memories. This mama did this quite by accident. My four year old twins eat a variety of healthy non-kid meals. Onlooking parents quizzically inquire how. I shrug while attributing our outcome to luck. Lucky me my instincts were an actual method I am reading about now. We made this dish last night. The sauce is fantastic! My kids LOVED it. Thanks for keeping salmon interesting.